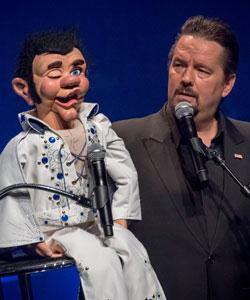 Terry Fator discounts - Hotels Etc. Fator's amazing ventriloquist and impression show is so good, you have to see it to believe it. With his cast of seven puppets - Cowboy Walter, Emma Taylor, Winston the Impersonating Turtle, Maynard Thomkins, Julius, Dougie Scott Walker, and Johnny Vegas - Fator effortlessly mimics the styles of stars like Elvis, Maroon 5, Etta James, Marvin Gaye, and more. And since Fator is constantly creating new characters, you can expect some new puppets to be unveiled at his Mirage performances, along with amazing new impressions. If you want to see what America fell in love with, don't miss Fator's headlining act at the Mirage. With his talk show of puppets and remarkable celebrity impressions, Fator provides a magical evening of entertainment. 3400 Las Vegas Blvd., SO.